Ever thought of having a side hustle in addition to your full time gig? Well, we did. We started Vow Muse in 2010 and have both been working full time as an engineer (Angie) and a copywriter (Alicia) ever since. And last week, GMA wanted to talk to us about it. 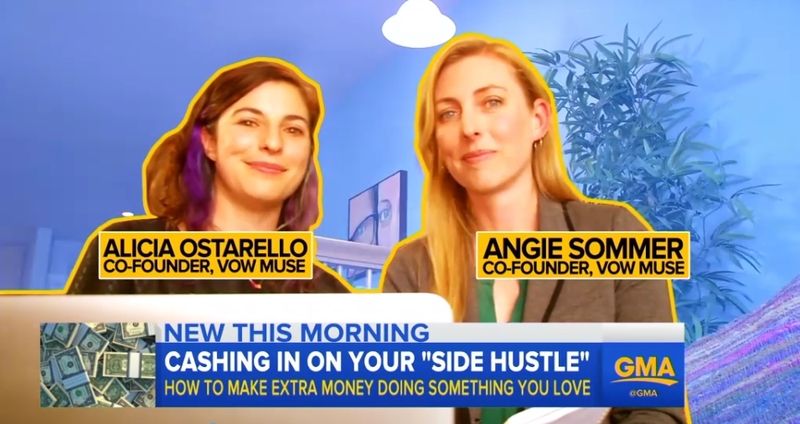 In response to a new book by Chris Guillebeau called "Side Hustle: From Idea to Income in 27 Days," GMA investigated this phenomenon in a segment on Monday morning, September 25. We were thrilled to be featured alongside two other San Francisco Bay Area side hustlers (Chris, the author, is based in the Bay Area) and enjoyed telling Becky Worley, who also has a side hustle doing podcasts, about our business' origins, how we have grown over the past seven years, and how we've made our side business successful. Big thanks to Chris Guillebeau, Becky Worley, and Good Morning America for reaching out to us for this fun piece!